The most popular name was Christopher and that is how I will remember him. I haven’t seen him since Wednesday. He wasn’t there when I opened my door on Wednesday morning, he only showed up once that day, I think to say goodbye and I haven’t seen him since. There were too many Robins. I was seeing four birds every time I looked out of my window. I think they were last year’s brood and that they just hadn’t dispersed yet. Christopher must have been one of the juveniles. I don’t think that he was hit by a bus, just because he did come to see me once on that last day. I think that he had to leave and find a territory of his own. I put off writing this post. I am a bit disappointed, just because it took me three months to get him eating out of my hand and I miss seeing him when I open my door. The way that I see it is that it was a wonderful experience and there is nothing at all to regret and I will try again. Take care Christopher (I have to stop calling him little bird now). Thank you. Now that was a sad post. I have got another post to write today. The Dog has been saying some things about me that are not completely true and I have some beautiful pictures to show you. Previous PostHe’s Got Wandering EyesNext PostDefamation of Character! Thank you 🙂 We may get to meet them yet. March is the start of the breeding season, young birds should have dispersed ages ago and if Christopher was a female then she might just be on nest duty and that might also explain her absence. I don’t really know where the little bird has gone, I am just guessing. Maybe it will reappear in a few days 🙂 Or is that wishful thinking? Better to have loved and lost than not loved at all! Can’t you grow your own? Technically I have a “No pets” clause in my lease, although that has never stopped me before. Yes, I was thinking along those lines before he disappeared. I certainly hope we do! Christopher Columbus travels the world 🙂 next time if you want the robin to stay or at least to come back, choose a name like Lassie (returns home) 😊 I hope the robin is fine. That’s a good one! Love it. See it’s just hard to understand that a face that innocent could say things that aren’t true. Fizz, you’re not telling tales on him, are you? May he remember you as you remember him. I prefer to think of him flying off on an adventure. Thank you Pamela 🙂 I am sure that he is on an adventure. He’s gone off to have a family of his own. Don’t be sad…..you kept him alive so that he could do that. 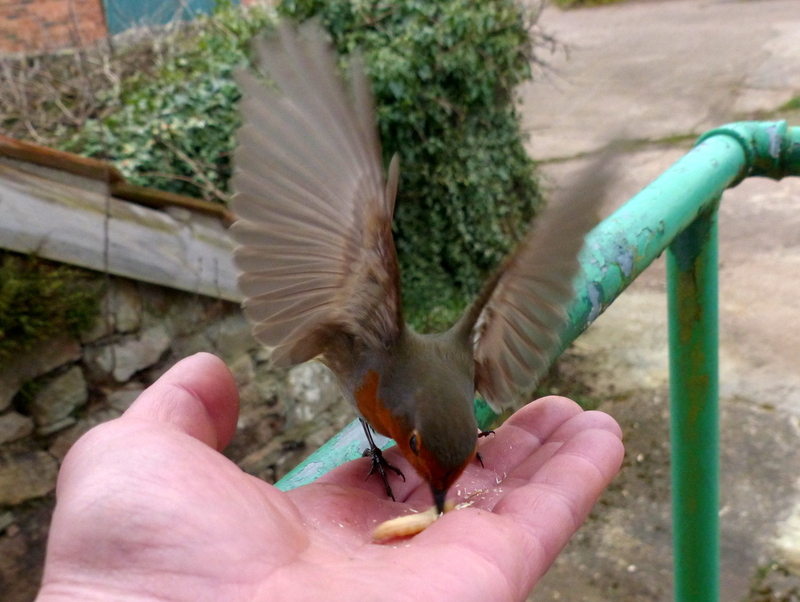 Ah… yet another Prodigal Robin. I hope Christopher comes back to visit you! Thank you 🙂 I am sure that he will. Life has way too many goodbyes in it. Think of the hellos. Thank you Cynthia 🙂 Yes. Every day has new discoveries. That may be one of the best quotes and advice I have ever heard. Aww. That is a sad post and I’m disappointed for you. Remember the joy he gave and that you were that special someone in his life. Happy Trails! Thank you Sandi 🙂 I do remember. That last shot of Christopher is very nice. I think the one-handed shots are very good too. I especially like the first. Colin, you were blessed with an experience not given to many. And, perhaps the worms you purchased gave a young female robin the strength to produce precious little fledglings. One day, don’t be surprised to find her free of her duties to come see you again. 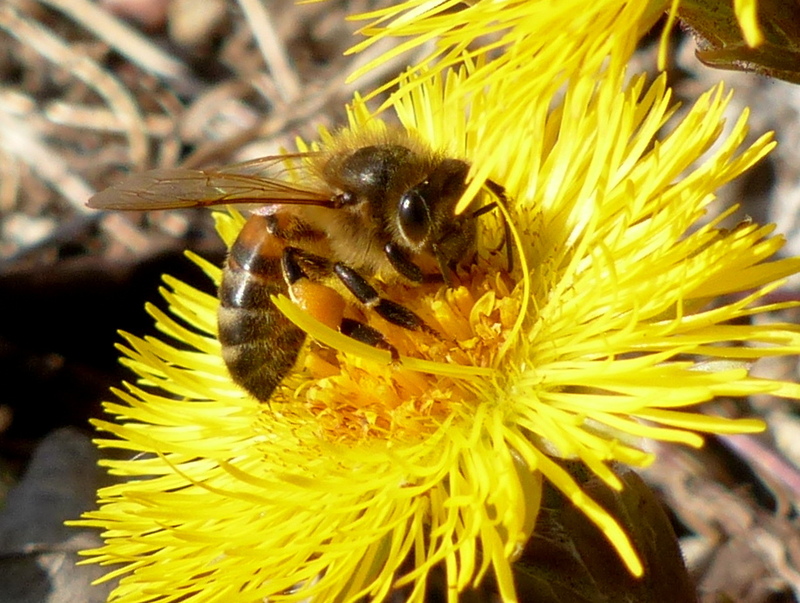 The picture of the flower and the bee is wonderful. Thank you for the joy YOU bring into our lives and we hope we learn more of Christopher/Cristy later in the season. I think your time was well spent, Colin. It was a wonder for many of us. I know each Post helped make my day, and I thank you. I hope you get to see him/her again, but it seems a wonderful experience and I’m very happy that you shared it with us. Thank you Dan 🙂 It was a good experience. Other Christophers made their mark beyond the confines of our own horizons . . . I just hope he’s a little better than most; kinder and more mindful of new places he will settle. Thank you Emilio 🙂 Whilst Robins can be very aggressive toward other Robins they are very tolerant of strangers. They have a strong maternal/paternal instinct and have even been seen feeding other birds chicks. He would not be like that other Christopher. We will all miss Christopher. Through your journal, we were all watching the progress between human and bird, leading to trust. What a lesson! Thank you Anne 🙂 Hopefully there will be more to come. How lucky to have known Christopher at all! That you were able to get him to eat out of your hand is a testament to your patience. I can’t help but thinkg of the experience as a metaphor for the fleeting pleasures of life. Carry on, Colin. Lots more out there in the woods! I am sorry you are missing Christopher. I was missing you! Thank you Clare 🙂 There are a lot of other Robins in the garden but they are just birds and they flit past me. My little bird sat outside of my door singing and waiting for me before bouncing over to see me. That wasn’t any bird and I do miss it. I will do this again. I am so sorry for you in your sadness. Your friend may return after the nesting season. So sorry that Christopher has moved on. Sure hope that he/she will return again. Thank you Lindy 🙂 I hope so. All of your mealworms will have set him in good stead. Thank you Maureen 🙂 Me too. Colin, often we make light of the posts people put up because we are all trying to be light hearted anyway, but after all the effort that went in to gaining Christopher’s trust I can imagine that you would be heart broken. I am truly sorry. Thank you John 🙂 Apart from missing the bird’s attention it is very frustrating to spend so much time taming an animal and then to lose it. What can you do? I will just have to start over. For ‘robin’ delete and read wife or daughter, or son, or second wife and in anticipation – second daughter. At least you know that next season you might get a better one. Bye Bye Birdie. it is sad for you Colin that you have lost your little friend, it is like losing a family member. I am sure that there is an empty spot in your mornings now, but it was wonderful for a while that it could teach you and give you joy. Thank you for sharing that with us and we are sorry for all the effort ending in abrupt departure. It is interesting that there was a courteous thank you visit to say good-bye, almost human. But there is much hope that little robin has gone off to make a merry band so we can be glad that the universe is unfolding as it should. When I was around age 9 I tamed a gray squirrel to eat out of my hand, and soon after she had a litter. One day she was hit by a car crossing the road to my feeding station. I never forgave myself and never tried to tame animals again after that. A number of years ago I had a bird feeder and had many little feathered friends, one cardinal in particular that I named Rex and mate Regina. He always came and sang for me whle I was gardening. Birds are so joyful to the spirit. Thank you Stephanie 🙂 A very sad tale about the little Squirrel. 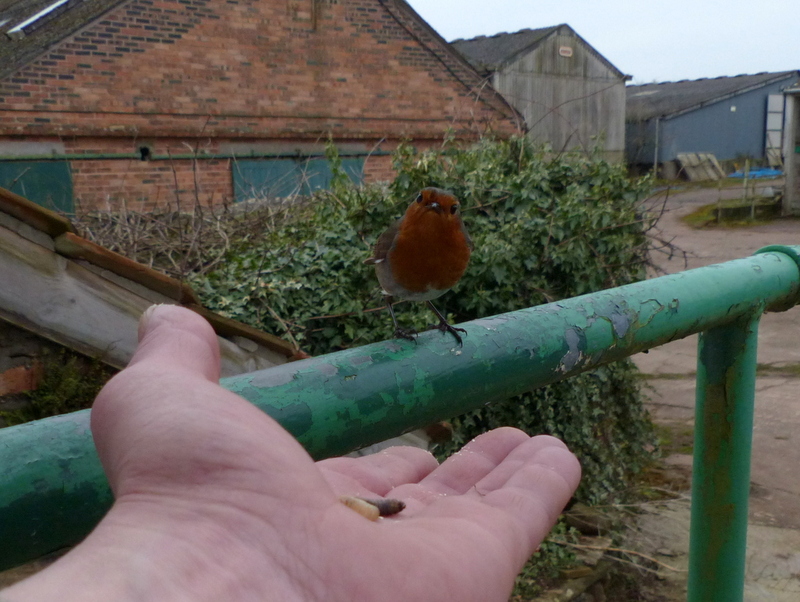 I have not given up on my Robin and will buy one more lot of worms in anticipation of her return. Incubation takes thirteen days and by next Wednesday she should have a little mouth to feed. Next Wednesday I shall have worms in place, just in case. Long live Christopher. Colin, thank you for bringing so much joy into our lives with your gentle, informative, and delightful blog. My thought is that a person could have all sorts of material blessings in life, but none could top the charts such as your experience with this beautiful little bird. The simple things in life are simply the best. Thank you Joy 🙂 Very true words. Great post! I have heard of Colt’s Foot but had no idea what it looked like. How wonderful that you have pinks growing wild, I have never seen that here. Thank you Jason 🙂 The Coltsfoot is always worth looking out for, it is great for attracting insects. Pinks? I don’t see them very often. I’m a few days behind and just saw the name chosen “Christopher”, as soon as I saw the name I immediately knew ” Christopher Robin” and the song started playing in my head, Perfect! He or she went off to make a family,they’ll be back as soon as the babies hatch and they scream for those expensive worms! When you put out a video with his song on it, I was very sad I couldn’t play it because my computer is not allowing me to, the flash player stops. 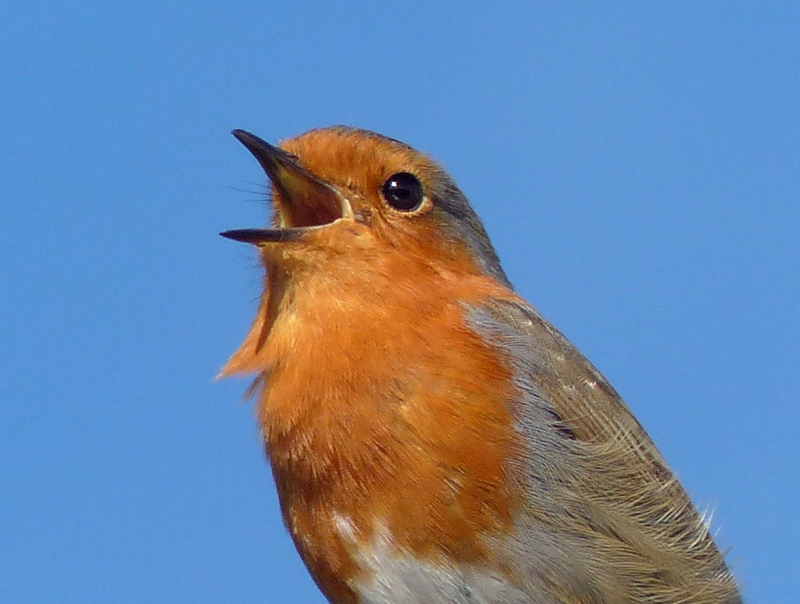 I know our Robins are very loud and obtrusive, I would of loved to of heard him.